Since some far-away-family continues to have a hospital adventure, I wanted to send a little Christmas cheer through knitting. It wasn't hard to find some Christmas-themed patterns from Mochimochiland. Narrowing down the selection to a manageable few was, especially knowing the (often bigger) challenge of getting them in the post was yet to come. However, I managed to just start knitting and that helped with the decisions. First up--Christmas trees--one for the hospital and one for the house. 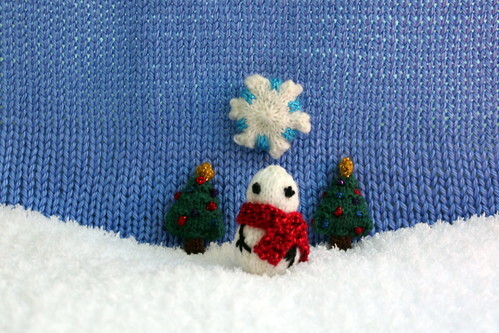 Then I knit a snowman, but it had to wait a bit for its embellishments. After that, it was time to try something new--the Special Little Snowflakes (currently free with any $5 purchase) pattern. After that, it was just time for photos and the post office. Pro tip: The photo session is extra challenging when the tiny knits are all so close together and they all have strong magnets inside them. As it turns out, the post office was the easiest part of this. I know, right? Now they're all on their way, and I can only hope they help to brighten the days!